Introducing the TEAC Discsprinter 300T Publishing System, an innovative feature rich system leveraging all of the best design concepts for an automated disc publishing and duplication machine. 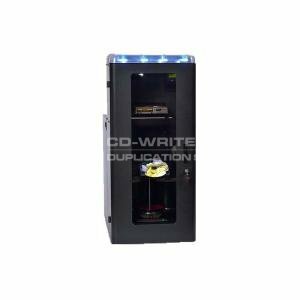 High capacity 300 disc unattended production, or four media types with delivery to the Mail Slot provides maximum flexibility in a single machine. Discsprinter 300T has printer support flexibility with a choice of black thermal, Preprinted media overprinting (ImageAligner), or color thermal print technologies. Customize any solution with Microtech's universal API's! environments out of the box, and feature Microtech's popular MyDisc, DiscPrint and Media-Remote programs. Ease of integration, optimized foot-print and the industry's most costeffective price point enable a no-compromise approach to digital publication, and a simple transition path for customers who require a competitive alternative to the costly, pre-configured solutions currently on the market today. Microtech lets you decide the features that are important to you and your bottom line! TEAC P-55 Thermal Printer uses the latest retransfer technology for superior photo quality and full disc coverage. The results are comparable to off-set printing. Xpression Thermal Printer is ideal for text or graphics on blank or pre silk-screened discs in either black or single color. * 4x 100 disc input enables use of multiple CD/DVD or Blu-ray media types, or 300 single media capacity. * Removeable media spindles simplifies media handling * Attractive Tri-color system status indicator lights for operator attention * Reliable, robust picker mechanism for high-volume environments * Three disc recorders for redundancy and throughput optimization. * Choice of printer technologies (Black Thermal, Color Thermal-retransfer) * Embedded Windows 7 PC for maximum compatibility (all software preinstalled) * Easy integration with Microtech's universal API (File based or XML) * Enclosure security to protect blank media and all moving parts * External 20 disc capacity mail slot delivery option. Teac . Discsprinter . 300T . 3st . BD . + . 1st . Xpression .